At the end of Part 1 Jamie was putting pen to paper for United, despite strong interest and more lucrative offers from Wolves. I think you were, briefly, United's record signing. Did the fee, alongside playing for your boyhood club, put additional pressure on you? Yes a bit and obviously it was a big step up standard wise as well. I'd come from the 3rd Division with Bury and I was playing alongside and against some very good players in Division 1. I was not a confident player, so I was always a little bit in awe. It was a case of, I'm here now, I need to establish myself alongside a team of players who had already done it. You know, all those big shot cockneys….ha ha. It took me a bit of time to settle in. You never seemed to get a decent run of games in the team. Was that a source of frustration and how difficult was it to deal with? Yes it was frustrating and injuries played a part. In my first pre-season we played Wednesday in a friendly. I tackled Carlton Palmer and I got a whack on my shin. I thought, 'Bloody hell that hurt'. Anyway, we are playing our first league game at home to Liverpool the week after. Liverpool in the first league game for your home town club and Harry told me I was playing. What Harry didn't know was that my shin was going yellow, green everything and it was killing me. I just thought, 'I've got to play, I want to play'. I played in that match and what a game it was. Huge crowd, hot, sunny day, great occasion, then Trace (United keeper Simon Tracey) fractured his cheekbone making a save and Pembo (John Pemberton) had to go in goal. (Ian - United lost 3-1, many Blades fans blamed Ian Rush's challenge for injuring Tracey). I had the drugs test afterwards and I am stood having a widdle next to John Barnes and Ian Rush! It was surreal, I had been playing for Bury a few months previous at Newport County and Aldershot. The Tuesday following the Liverpool game, we played Derby County at the Baseball Ground and my shin was getting worse and worse, but I was picked again to play. I lasted about 60 minutes, came off and they took me into the medical room and their doctor looked at it. I was rushed into hospital on the day after as it had turned into an abscess on my shin. When they operated they told me I could have lost my leg as it could have gone poisonous. I just so wanted to play that the pain didn't matter at the time, but looking back I think bloody hell how stupid was I? But with hindsight you think, no as it meant I made my debut against Liverpool. Much is made of the team spirit under Harry. What are your abiding memories? Harry used to take us down to army camp pre-season, so we turned up at Bramall Lane on the Sunday and travelled down to Arbourfield, near Reading. I had come from Manchester City and Bury, where it was very strict pre-season, no drinking, nothing. Anyway, we got to the camp and did the bleep test at night and then, I remember it clearly as I still talk to Ian Bryson about it, we sat in our dorms and all the lads are having a shower, putting their aftershave on and getting all their gear on. I said to Jocky (Bryson) "What's happening?" and he said, "We are going out, Harry doesn't mind. As long as we are back and ready to train and work hard in the morning he doesn't give a monkeys." That epitomises everything about the place at that time. And nobody missed training. Everybody gave 100% when they had to, but everyone "played" 100% when they could do! You scored your first league goal in a Blades shirt at Bramall Lane v Everton, do you remember much about it. Can you describe the feeling? I am sure it was a left footer, half volley past Neville Southall. It wasn't a bad un. It was the Kop end and it is a boyhood dream fulfilled. You have stood on that terrace as a kid, been ball boy at that end and to score at that end was storybook, Roy of the Rovers stuff. A cliché maybe, but it is so true. One of your favourite moments must have been the goal in the FA Cup victory over Manchester United at the Lane. You got in the right place, but when it came back at you off Schmeichel did you know much about it? What are your over-riding memories of the day? When Giggs scored after 15 minutes we thought, Oh bloody hell this could be an embarrassment on telly and then we got to grips with it. Then came the goal. Glyn Hodges swung in the free kick and I should have scored when I threw myself towards it, leg outstretched in the box, but I just saw this massive Dane coming towards me! It came back off him and hit me as my momentum took me towards goal and……well yes, it hit my arm. My son slaughters me for it and I just say, "Well, I've scored against Manchester United, in front of 30,000 fans and it was on the telly." That season saw a great cup run, culminating in the Steel City FA Cup semi-final at Wembley. You were in the starting eleven for the run of matches up to two games before Wembley, was it an injury that kept you out? No, it was just Harry being Harry. He broke Carl Bradshaw's heart that day. I remember when he named the team, we were training at a non-league ground close to Wembley. He had named me and Adie Littlejohn as subs and Brads wasn't even in the 13. Brads grabbed his boots and chucked them in someone's garden. He was absolutely distraught. It hurt me to be on the bench. I had played in all of the cup run from the Burnley replay and then to be left out was absolutely devastating. Was it a day of mixed emotions for you? Gutted to be on the bench, delighted to get on the pitch, gutted with the result? Well in the end I got on for the last half hour and if it hadn't have been for Alan Kelly, the brother in law, I wouldn’t have even managed that. It was a one man show that kept us in the game. My main abiding memory of the day is Mel Rees…..even saying his name and thinking about the day now sends a tingle of emotion through me. 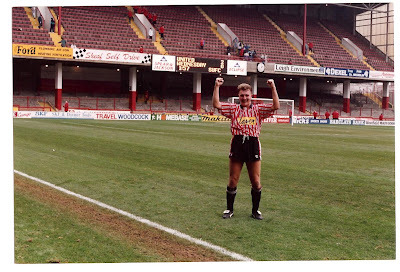 The FA wouldn't let him lead us out, which rankled with us all, but I am glad they didn't really because his walk around the stadium pre-match was brilliant and epitomised what Sheffield people are about. The reception from all fans was amazing and he hadn't played that much for United, but it was an amazing reception. He knew then, that was his day and it wasn't long after that he died. On a lighter note another memory is Corky shaving his beard off in the bath afterwards. He had pledged to grow his beard until the cup run was finished and when we drew Man U in the 5th round I remember him saying, "thank **** for that, I can get rid of my beard now we are going out!". It was a bizarre sight when he scored at Wembley, looking like Old Father Time. How can you describe playing in a Sheffield Derby being a fan as well as a player? I remember the first game as a player, 1991 at Bramall Lane and the first league Sheffield Derby in 11 years, first top flight derby in 21 years. Harry had got us revved up and we had heard rumours about them talking bets on how many goals up they were going to be after 20 minutes and how Shez (John Sheridan) was going to run the show. 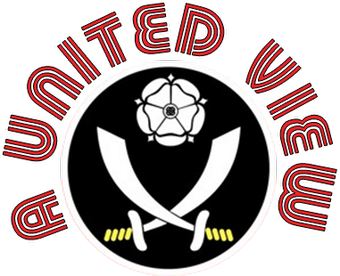 There were three Sheffield lads in our team that day and for a Sheffield lad to walk out at Bramall Lane with the noise was just…..I remember seeing Roland Nilsson, the right back for them, and he was like a rabbit in the headlights, just stunned. Whereas we were like, "Come on, I can't wait for this". First tackle goes in and it's Carlton Palmer, a melee ensues and suddenly there were ten United shirts immediately around; ready and at 'em and grabbing people. Yeah it's probably not right, but that is how much we were a team and wanted it. Everything went right that day and I still have a picture that was taken as I came off at the final whistle, with the scoreboard behind me saying United 2 Owls 0. I keep it with my shirt. Afterwards we all went to The Big Tree at Woodseats. Now it would be all over the tabloids, but we partied, I remember players dancing on pool tables, holding a Rottweiler with a Sheffield United scarf on! Then it started again, the day after you got the Star pull-out and you can’t wait to read it. Unbelievable times, for a week we partied and celebrated like we had won the World Cup. We had to go to Tottenham on the Saturday, yet we still beat them 1-0! Playing in a Sheffield Derby is an unbelievable feeling, you are on the field and it’s as if you can touch the atmosphere. Everything is 100 mph, but you’re in a bubble. The crowd’s there and the noise just seals you in. I wish I was there on the pitch today. In the 1993/94 season you had a spell on loan at Bristol City, was that due to injuries or form? Did you think you were likely to leave? We lost 3-1 at Hillsborough in the Derby match and Harry blamed me. We were going away to Dubai the week after and he left me out of that. I went to see him and he gave me a bit of stick and I thought, “Aye aye! The writing’s on the wall here.” Bristol City came in and I thought that I had to get out, get away from Harry for a bit and clear my head. I was never going to go there permanently, I just needed to go and try and prove him wrong so I would stay at United. Jamie was to remain at Bramall Lane for a little while longer. In the final part; leaving United, life with the Clarets at Turf Moor, Scarborough days, coaching and Jamie's big challenge to raise money for Gary Parkinson.